* count Sophie Goldstein among the young comics professionals who wish to supplement some of their comics-related income with money made through Patreon. 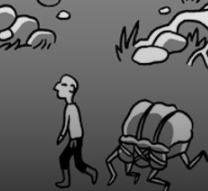 * the big talked-about thing in my neck of the woods is the current 2D Kickstarter, which looks like it will make it but surely isn't one of those runaway campaigns already over the top. Some attention is still necessary. That new Mirror, Mirror looks good. * other names popping for me from the crowd-funding realm given a moderate survey are Sandra Bartholomew, Ally Shwed, David Willis and P. Craig Russell. * finally, the Zanadu Comics gofundme was still active as of eight days ago. The Seattle institution put that up a while back for help with some capital necessary to make the whole operation run more smoothly.